Meet the new Sonata…same as the old one? Hyundai would rather have you think otherwise. 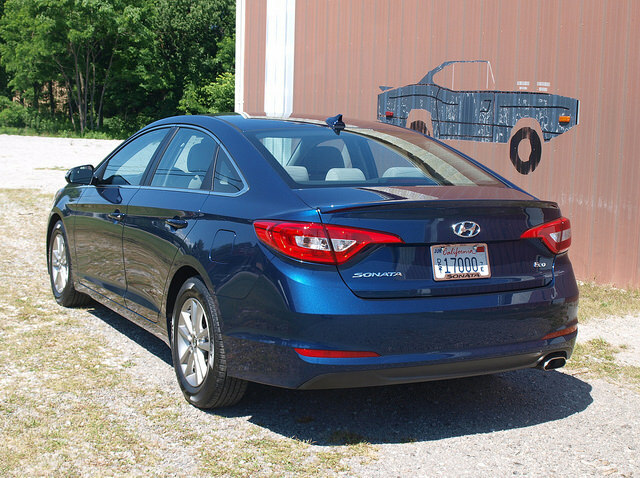 The 2015 Sonata has arrived, sporting a “mature” look with a few new twists to their midsized family sedan. A week-and-half after driving the outgoing model, I drove the new model along U.S. Highway 12 from Chicago, through the south shore of Lake Michigan and into southern Michigan countryside towards Ann Arbor. It was the perfect chance to get a feel of the changes Hyundai made to their popular family sedan along some bucolic and charming countryside. The last Sonata was edgy with its Fluidic Sculpture design inside and out. This model stood out amongst the crowd, though some elements had been adopted by its competitors. The public responded with over 825,000 units sold since its introduction in the spring of 2010, selling over 200,000 units every year for the past three years. According to Mike O’Brien, Vice President of Corporate and Product Planning at Hyundai Motor America, the Sonata is responsible for 29% of all Hyundai sales annually. Instead of creating something more revolutionary, Hyundai adjusted the best elements of the prior Sonata onto Fluidic Sculpture 2.0. Essentially, what O’Brien said that while the first Fluidic Sculpture Sonata “got us into the party,” the new model is “going to get us invited back.” In other words, Hyundai felt that if new Sonata was going to look more radical than the last, the customers might feel more alienated from it. What the new Sonata signals is a “maturing” of their Fluidic Sculpture, achieved by “doing things a little smarter…something that looks more premium…more value,” according to O’Brien. Hyundai achieved this by retaining two design elements outside: The coupe-like roofline and the chromed “sabre” line. These are the only two links between the outgoing and new Sonata. Everything else has “matured,” including the front and rear ends. The interior went through a more dramatic change. Instrumentation and center stack are now orientated to the driver with more accessibility to controls and readouts. Though it retained its large passenger space from the previous model, there is improved rear seat seating with more head and leg room than before. The Sonata is now offered in three engines, including the brand new Eco model. A new 177-horsepower 1.6liter turbocharged four is dropped into the Sonata Eco, combined with a brand new 7-speed dual clutch transmission. This driveline was designed to be the most efficient and economical non-hybrid Sonata ever. 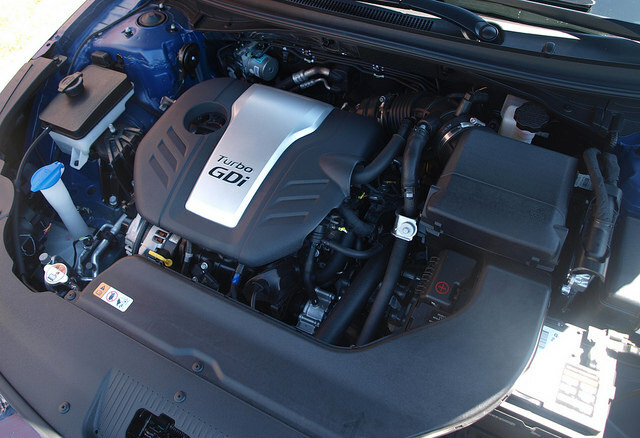 Power is down on the two remaining engines – a 185-horsepower 2.4liter four-cylinder and a 245-horsepower 2.0liter turbocharged engine – to induce more efficiency and fuel economy. A Hybrid model is coming, but not for another year. One of the Sonatas I drove was the Eco. The new model may be a bit more expensive than the base SE it is based off of, but the 1.6liter turbocharged engine and 7-speed dual clutch transmission is for real. This combo loves the throttle and delivers quick, unobtrusive shifts to make it a very comfortable car to drive in. The low-rolling resistance, high sidewall Hankook tires make driving a pleasure – for the average family to roll along two-lane highways and Interstates alike! Two Limiteds with the 2.4liter engine were also driven during this time. I would say that it drove similarly to the 2014 model reviewed previously. The huge change is the new cabin, with controls, infotainment screen and instrumentation confirming the huge improvement from the last generation – the YF. These Limiteds were fine, but I was drawn more to the Eco. The overall comfortable experience of the more efficient Sonata won me over. Overall, pricing is the same as the last model – starting at $21,960 for the base SE model. This is actually a $300 reduction in price compared the 2014 Sonata GLS base model. Aside from the SE, Eco and Limited, there is also a new Sonata Sport model. Pricing will scale up into the mid-$30,000 range for a fully loaded Sport 2.0T Ultimate model. While the 2015 models are now showing up in showrooms across the U.S.A., the Eco model will arrive in showrooms later in the year. Though the 2015 Hyundai Sonata has changed, the improvements and the addition of the Eco model will make things a bit more competitive in the midsized sedan segment. Is it the same as the old one? 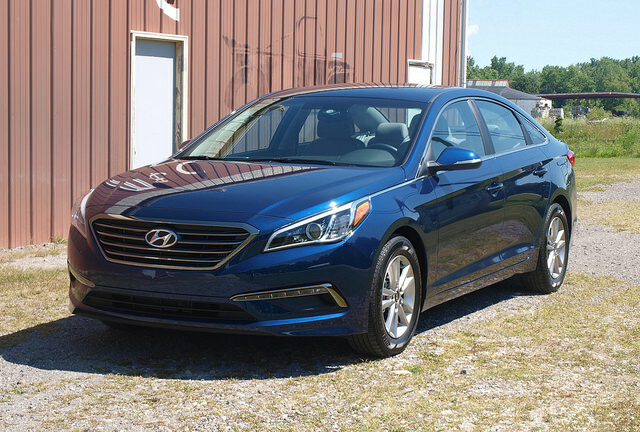 The 2015 Sonata is worth checking out.